1. Orders must be over $300.00 to receive free shipping. 2. Free shipping offer only applies to business addresses in the continental U.S.A.
1. We accept VISA, MasterCard, American Express and Discover. Have your credit card number ready for quick ordering. 2. COD: Any order less than $500.00 may be sent COD. The customer is responsible for any COD charges billed by the carrier. First time COD orders greater than $500.00 will require cashier's check or money order. Cash or money orders are required for all out of state shipments. 3. Net 30: Plastic Hangers USA offers Net 30 day payment terms to approved customers. A credit application must be completed with the necessary references. Please allow 3-4 weeks for processing. Ask your sales representative for details. Plastic Hangers USA makes every effort to send your shipment the best way - via UPS, Common Carrier or FOB Factory. All shipping charges, including COD fees, are the responsibility of the customer. We will gladly accept any return within 30 days of invoice. Returns will not be accepted without prior return authorization. Returns must be in the original carton, must include a copy of the invoice, and be in new condition as determined by Plastic Hangers USA. All returns are subject to a 15% restocking fee. Special orders, close-outs and used items are not returnable. 1. UPS DAMAGE / FEDEX: If you discover damage after opening package, call UPS or FEDEX for an inspection. Save all packing materials. Do not return package to Plastic Hangers USA yourself. 2. Common Carrier damage: Inspect all merchandise before driver leaves. Note all damages on both your copy and driver's copy of freight claim with the carrier. 3. Concealed damages: After opening package, call carrier immediately for inspection. Save all packing materials. If carrier does not respond within 10 days, contact Plastic Hanger USA Customer Service Department for assistance. It is important to open all cartons immediately to be eligible to file a freight claim. 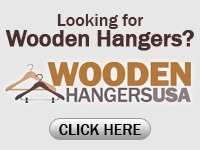 Plastic Hangers USA will gladly provide pricing on non-stock items. All special Orders must be accompanied by a 50% non-refundable deposit. Special Orders are not returnable.